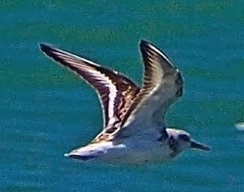 as it runs back and forth on the beach, picking or probing for tiny prey in the wet sand left by receding waves. 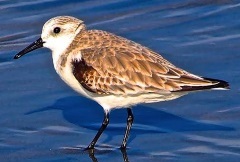 Sanderlings are medium-sized “peep” sandpipers recognizable by their pale nonbreeding plumage, black legs and bill, and obsessive wave-chasing habits. Learn this species, and you’ll have an aid in sorting out less common shorebirds. These extreme long-distance migrants breed only on High Arctic tundra, but during the winter they live on most of the sandy beaches of the world. Sanderlings breed on the High Arctic tundra and migrate south in fall to become one of the most common birds along beaches. They gather in loose flocks to probe the sand of wave-washed beaches for marine invertebrates, running back and forth in a perpetual “wave chase.” During migration and winter, they forage on beaches but will also use mudflats. Sanderlings nest in the High Arctic on gravel patches and low-growing, wet tundra. 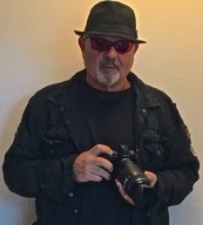 predators away from the nest. 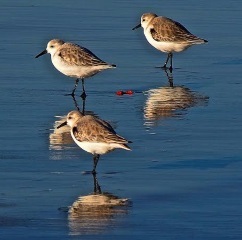 Outside the breeding season, Sanderlings twitter in large flocks, each giving a series of soft, squeaky wick wicknotes. This tiny bird is one of my favorites. I love to see them dodging waves on the beaches of Imperial Beach as they forage for food. 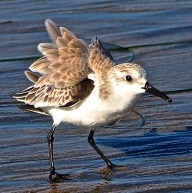 Look for these cute little birds while enjoying a walk on our great beaches.